Hohoho, been a while since I’ve done one of these! This weekend: Kazak Doktor and a Building! Pretty stock standard, nothing spesh. 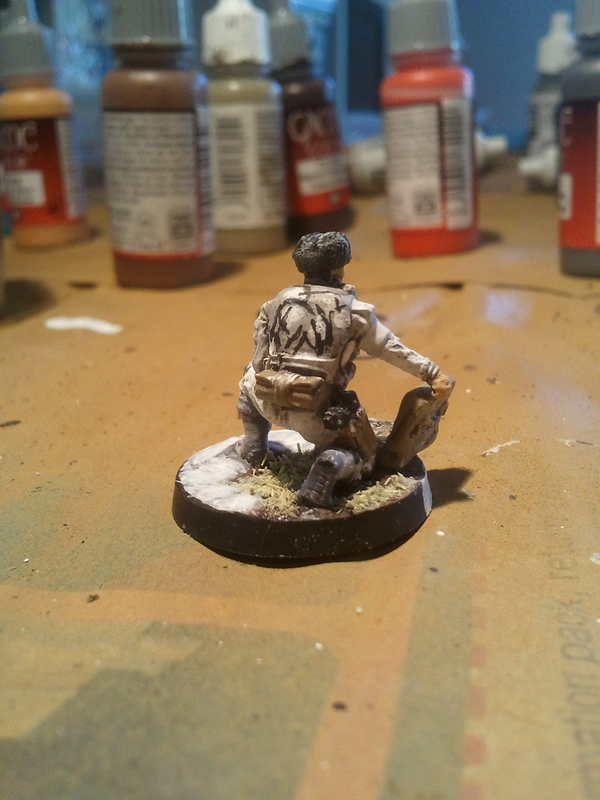 Camo is on the jacket, white splotches on the stonewall grey jacket just like on the body armour of my heavy infantry (Vet Kazaks, Tank Hunter). I was tossing up between this and the uniform, and even considered no camo on this model because of the nice two tone with the jacket and uniform. I think the choice of the camo jacket was the correct one though. Here we have the building I’ve been working on. My last post contained all the pieces cut out, and here we see the completed ground floor. Note some issues. Firstly: cutting straight with a jigsaw is somewhat of a challenge, especially when you’ve never used one before. So I cut 5mm in too close on the back end of the base. Rather than shifting the whole building forward on the base, I decided to erect it as I had planned, leading to the stairs overhanging by 5mm or there abouts. I’ll fix this later through a couple of strips of 3mm MDF glued together I think. Other thing is the gap where the stair walls join at the corner. I’ll fill this with modelling putty, or wood putty, that’d should do the job too. Good things through were painting the interior first. This was something I learnt from my test straight foamcore buildings earlier in the year. And here we have some shots of the first floor, which I completed the following day. I was incredibly surprised at how well it all went together (this goes for the ground floor as well, but not so much) and even more so how the first floor sits nicely on the ground floor and is (fairly) easy to remove and replace in the right spot. The first floor is 3mm ply that is seated within the walls, the base of which are ring with a 5mm strip of foamcore cut at 45 degrees. 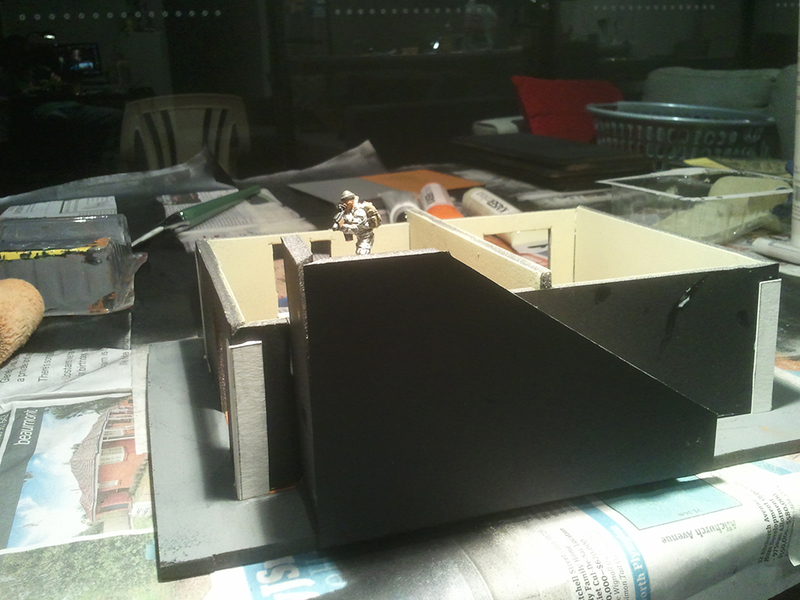 The foamcore running around the outside masks the cut between the ground and first floors and ensures the first floor sits on top nicely and can’t be knocked off. 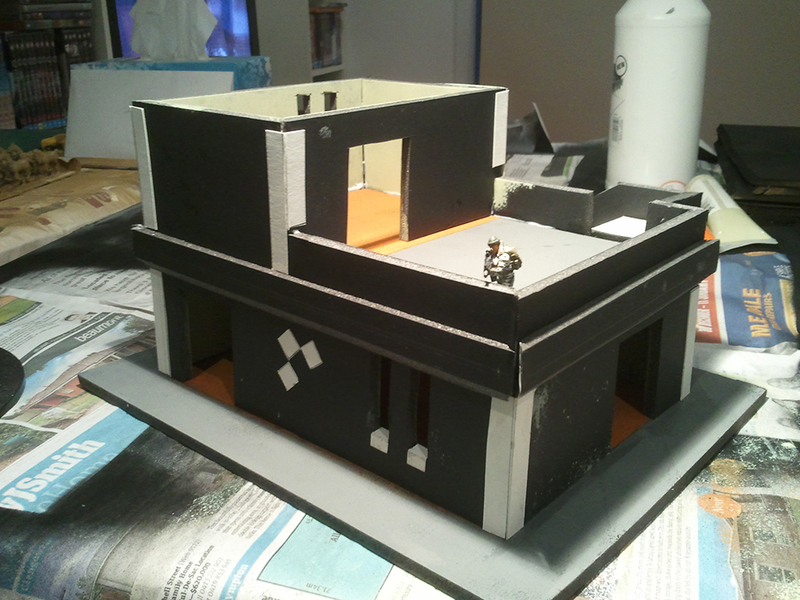 Again with the first floor we have some issues with gaps, again these will be fixed up with modelling or other putty. I still need to sort out the roof for the first floor. The pieces I cut out were, as I thought they might be, a pig’s breakfast. I’ll remeasure and redo and we’ll see how things go. Once that has been sorted I will paint the exterior. 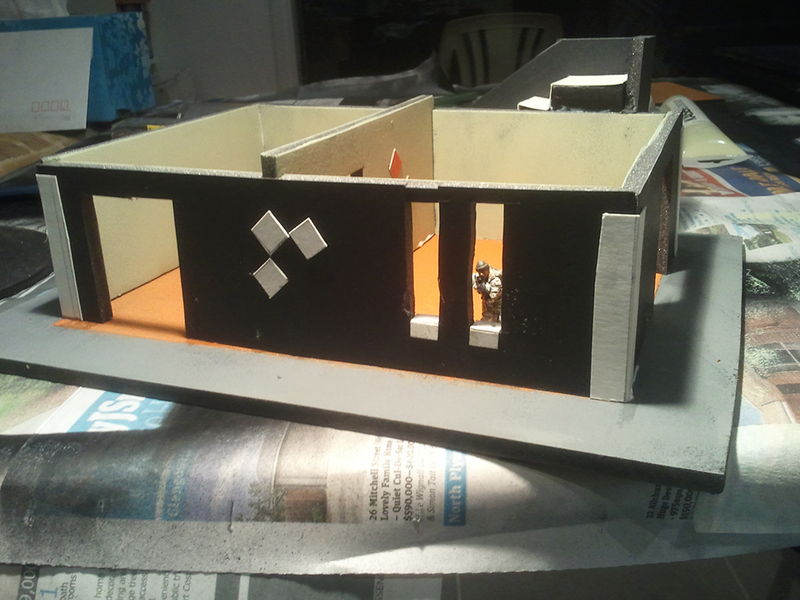 After the exterior is painted I will move on tot he details. The first things that need doing will be the external doors, which will be held in place as I mentioned in my last post with magnets. These are strong enough to hold the light weight of the card and plastic I will be using in place. 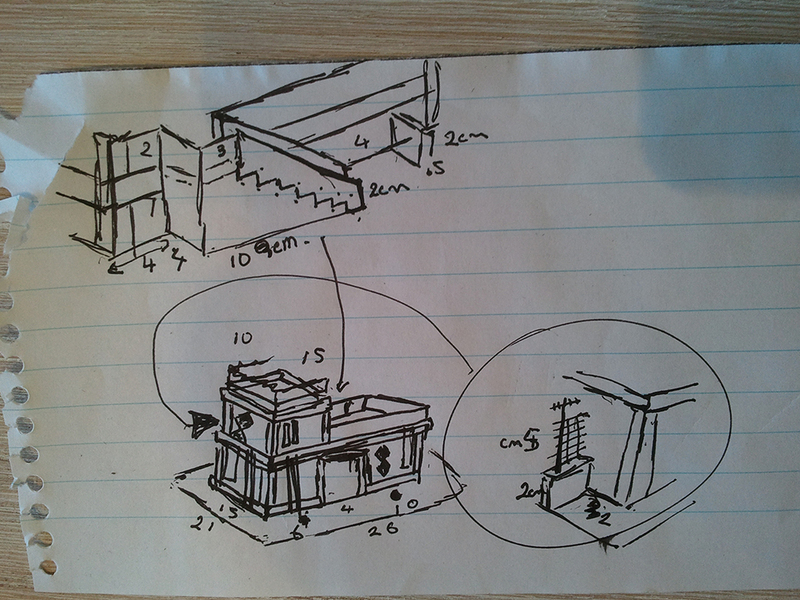 The other details I intend to do are a couple of desks with computer terminals (one downstairs, one up), some crates and or boxes (probably some on the open area up top and in the room below) and maybe a shelf for some smaller boxes down stairs. The reason for these interior details are twofold. Firstly they might be used for mission objective purposes. The second reason is that the floor space of the building is quite open, and I’d like to add detail to fill it in, create some interest and variety. This whole project is taken longer than I first thought it might, but I’m doing my best to remain patient and do the job right. The Cult of Now really is an insidious affliction of our modern society. this weekend holds Pathfinder tomorrow (Saturday) and games of Infinity on Sunday. I’m hoping to upload images and write those up, so hopefully I’ll have an update again Monday. Until then. So I’ve not been inactive since my last update, in fact I have been fairly active working on Infinity related things. 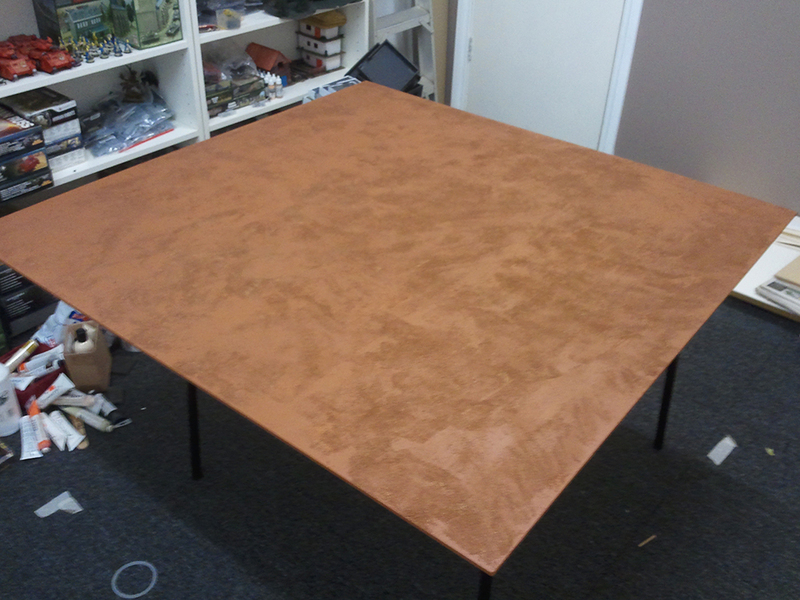 I’ve got the desert table base done and I am now working on terrain for it (with varied levels of success). In addition, most of the massive Infinity order I put in about a 2-3 weeks ago came in the week before last. Loads of stuff for both my Ariadna and Japanese Sectorial Army, with a few more things still to come (not many though). Loads of stuff! Loads of it! So the board has been sanded, painted and it looks nice. The left image was a work in progress one, can’t remember afer which colour, the one on the right is the finished product. It was done as follows: glue sand to board; seal the sand; beasty brown equivalent colour house paint; heavy drybrush (sort of, more like a lighter normal coat) of desert yellow equivalent colour house paint; dry brush of unbleached titanium craft paint. The end result still is quite brown really, but it matches very well with my Flames of War DAK force, though my JSA have darker looking bases, so that was a bit of an annoyance. Still, it will do the job and that’s all that really matters. 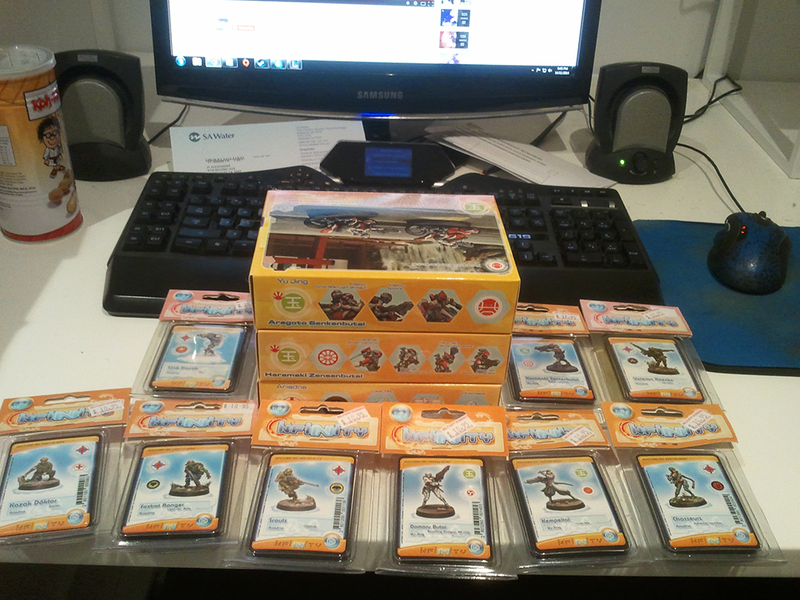 I’ve also started on some of that pile of miniatures I purchased. The Traktor MULs (very bottom box) I’ve passed on to my parents for them to gift to me at Christmas (I care not for surprises. I have – for years – purchased the gifts I want people to give me and passed them on to them to gift me. It’s just easier when you have hobbies no one else follows/is involved in). 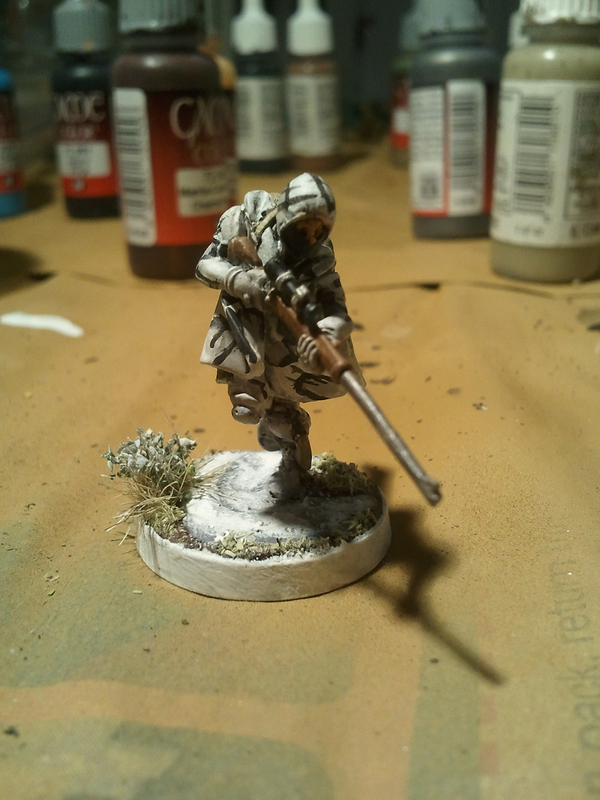 So far I’ve painted the Scout and the Veteran Kazak. First we have the Scout. Of the two he is the one I think I’ve done the better job with. 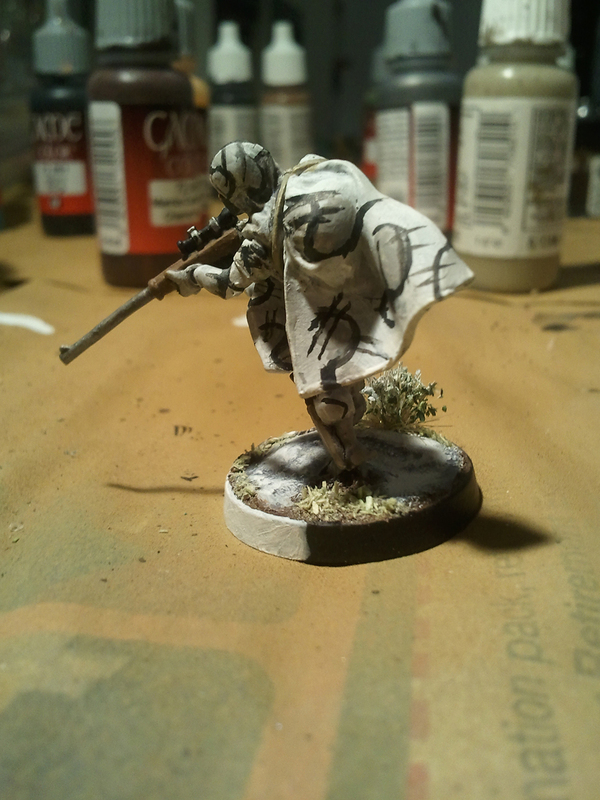 The cloak was good fun – and pretty easy – to paint. 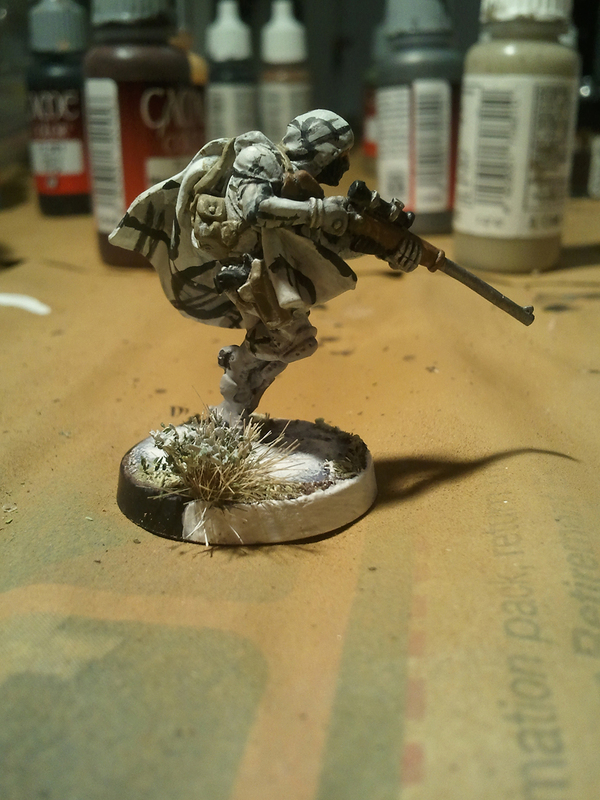 The camo pattern is based on how you paint splinter camo for mid/late-war German infantry. Actually it might be exactly how you do it, I forget if the splinters are supposed to intersect the dark lines or join colour patches. Point is, snow camo, looks pretty cool. 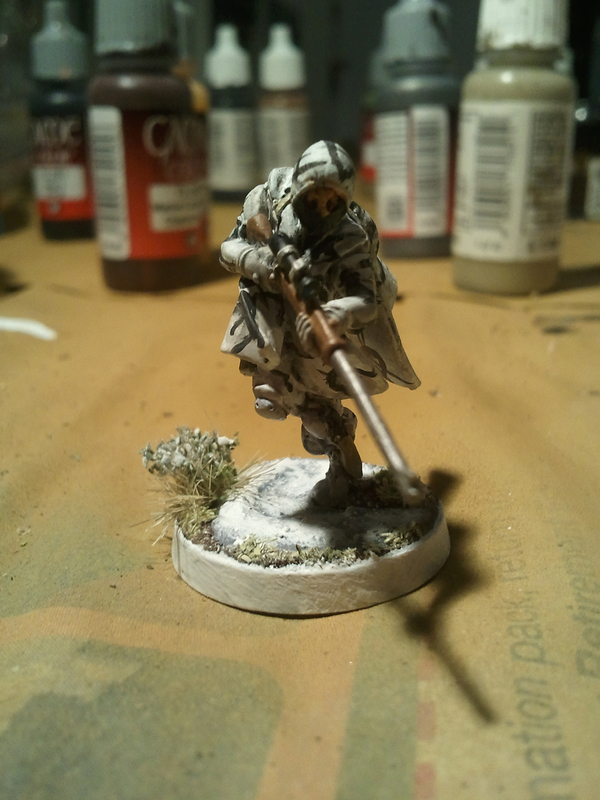 A couple more shots of the Scout from the other side. It’s a pretty sweet model, I don’t think the image of it on Corvus Belli’s site really sells it enough because I always thought it looked a bit odd. But it is good. Also leafy tuft. 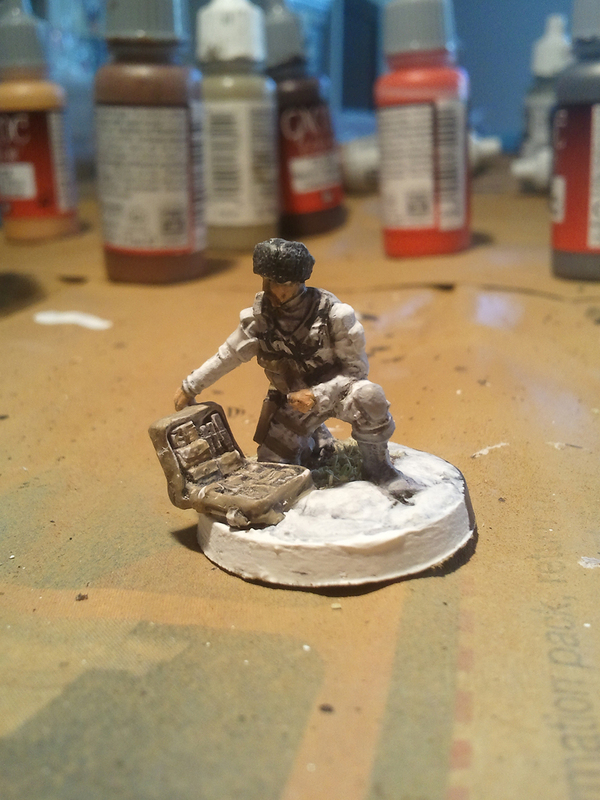 I’ve painted/drybrushed the top of it to make it more snowy. 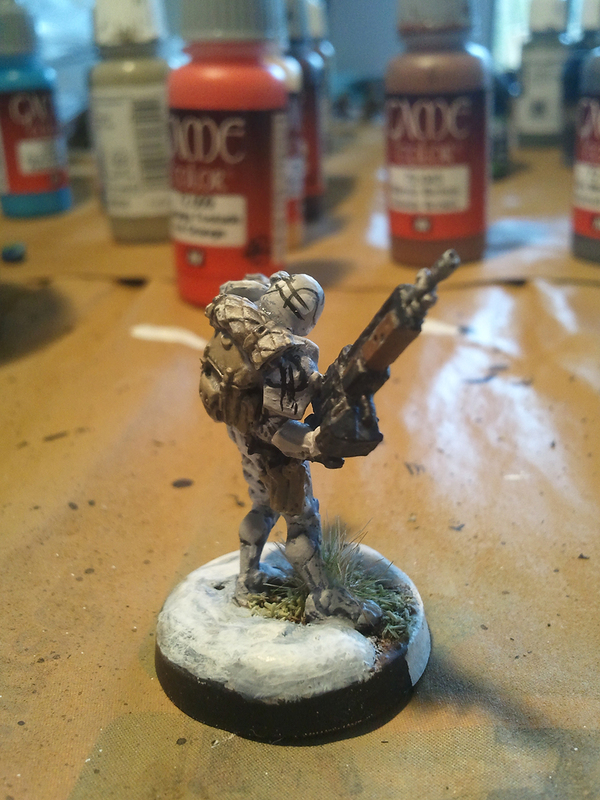 Next we have the Veteran Kazak and his AP HMG. At 61pts and 2SWC (1 if you field him as your Lt) he is a pretty pricey model to field, but it is an AP HMG on a model with no wound incapacitation. 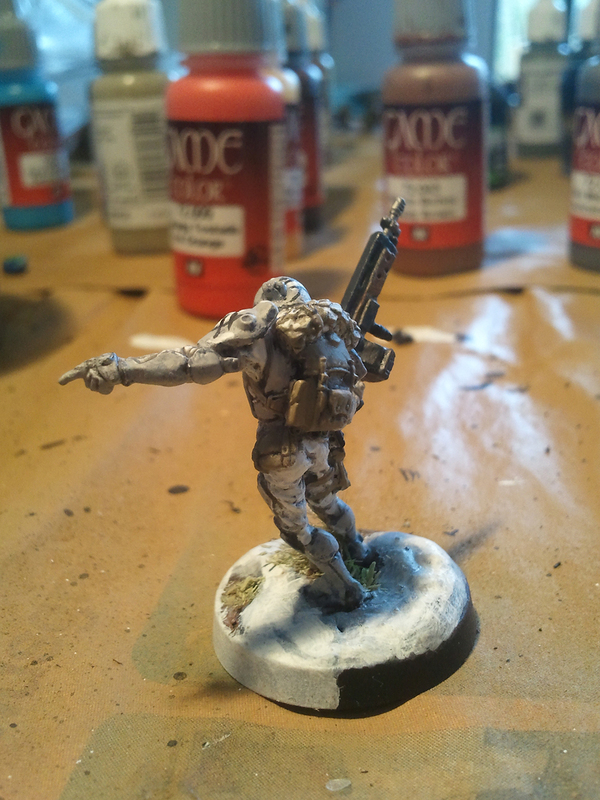 On these heavy infantry models I invert the Stonewall Grey and White to do the camo on the body armour (that is the armoured vest is Stonewall Grey so while the camo C and S lines are still German Grey, the splotches are Dead White). 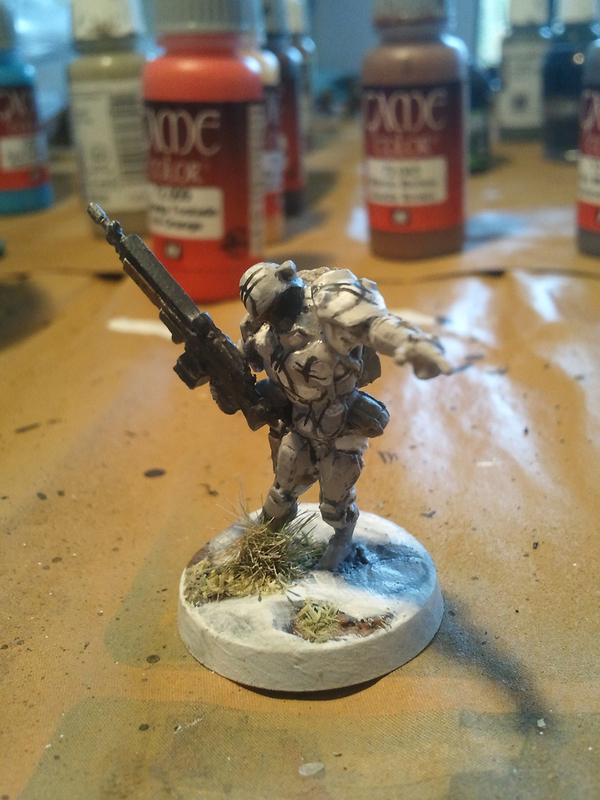 This is actually the first model I’ve done where I decided to do camo on the body armour and shoulder pads. My Tank Hunter with his autocannon and Veteran Kazak with T2 rifle both only have camo helmets. 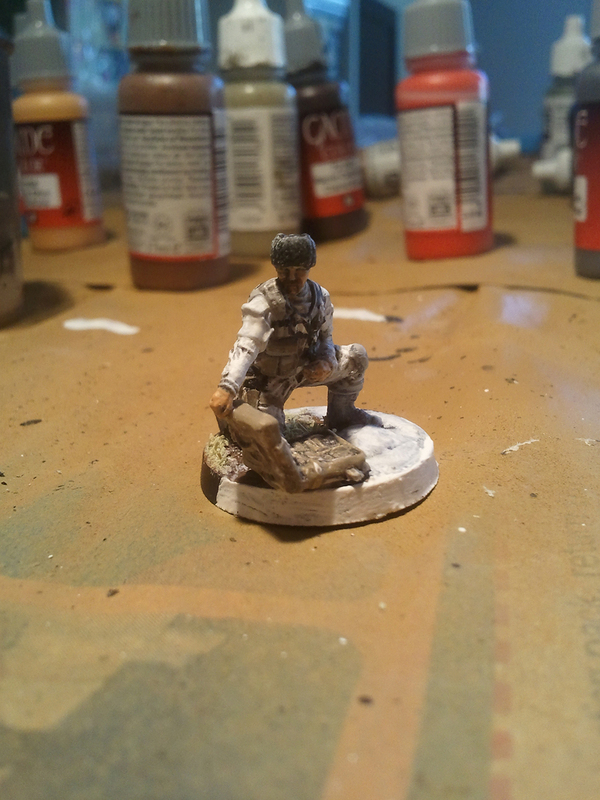 Given the small amount of clothing visable, I didn’t bother doing camo on the pants/jacket as well as the armour. I think it might be a bit over the top if I did anyway. This model has a fairly bizarre pose. I think the head really needs to be vertically straighter because as the model has been designed it looks a bit mangled. 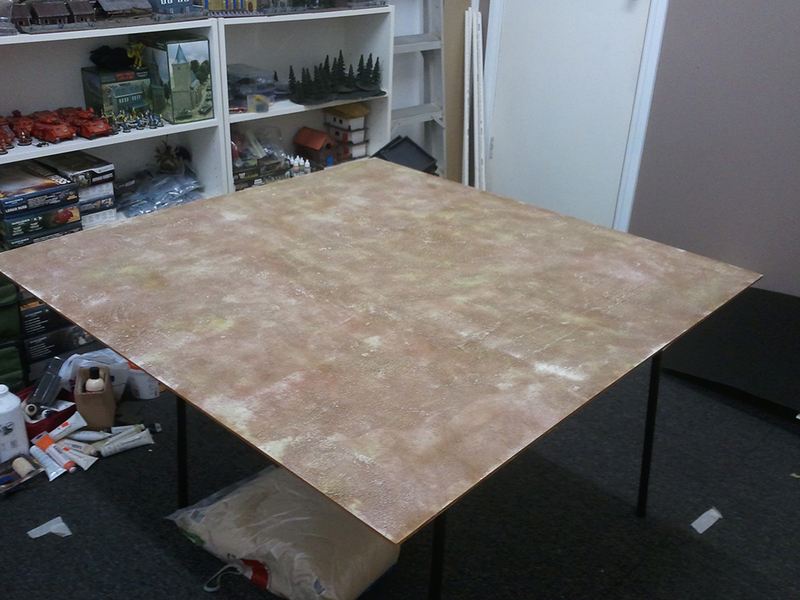 Finally we have the first bit(s) of terrain for the desert board. On the left is the design I sketched up during some down time at work. 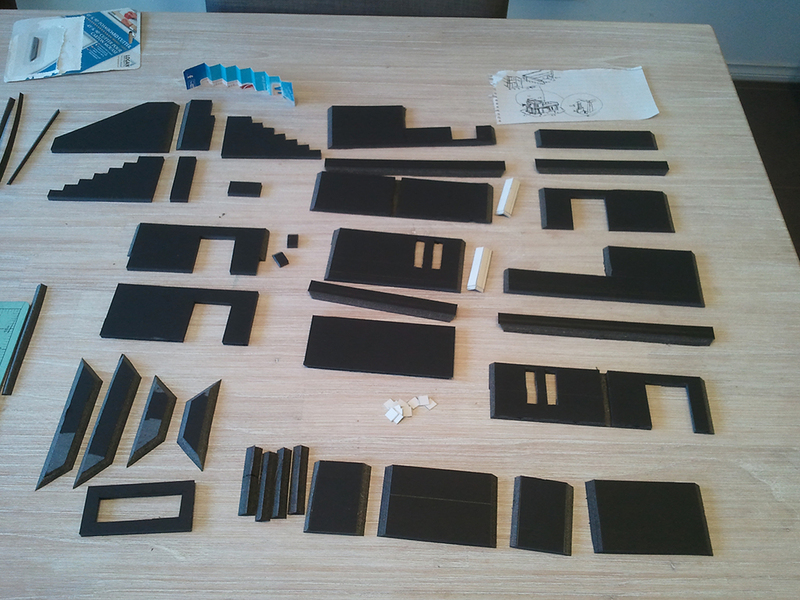 On the right is the pieces all cut out and ready for assembly. The only thing I’ve altered from the drawing is not having a flat roof for the first storey part. Instead I am going to to try some sloped roof with skylight thing. The idea being that you could use it for an excellent vantage point, but you”ll not have cover to benefit from. I think this will give a good trade off in terms of pros and cons for that part of the terrain. The other thing I’ve added is the parts along the bottom right of the image, which are for a shipping container to use as scatter terrain. I’ve still not quite got how I will do it in my head because I want the doors at either end to be hinged. 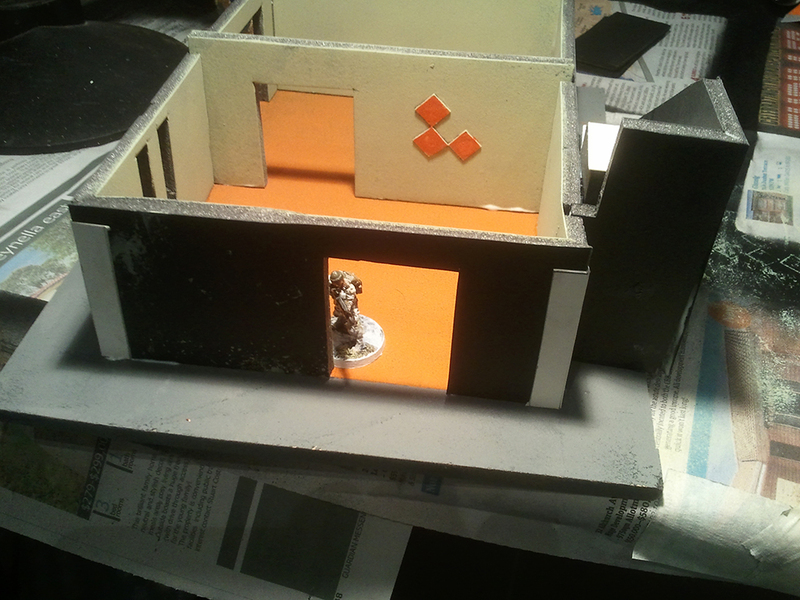 Other things that aren’t shown in this image include the MDF I’ve cut out for the bases (which were drying after a black spray undercoat at the time) and the doors (which I’ll do last). I intend to have doors that can be opened and closed on the three external doorways. These will be held in place by rare earth magnets (I really need to remember to order a pack or two from Battlefront), and should be pretty easy to remove with 5mm of foamcore between the magnets (I’ve not actually tested to see if they’ll even hold actually. I should probably do that at some point). 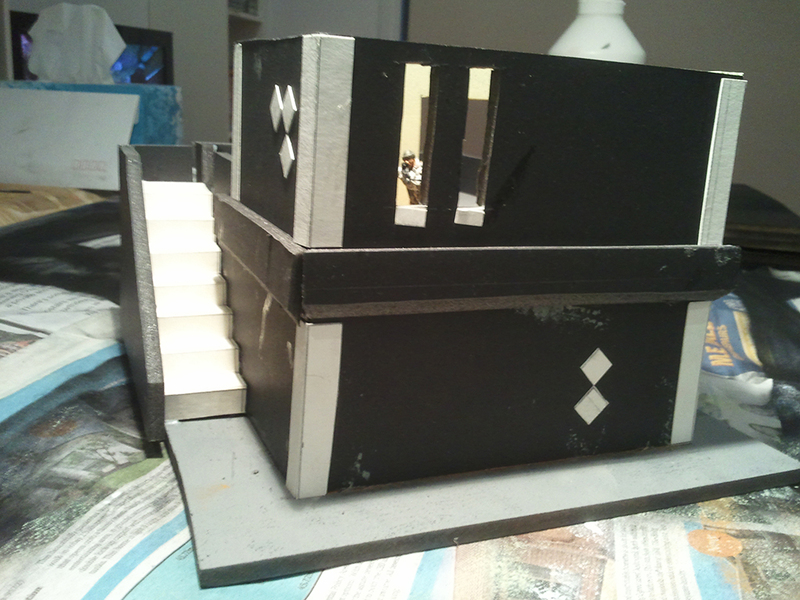 The other detail that isn’t too clear in the photo is the cardboard I’ve cut out for the corners of the building, plus the cardboard squares I intend to glue on for patterned decoration. I’m not sure how it is all going to turn out in actuality, but we’ll wait and see and hopefully it isn’t too shabby. Anyway, that is all for now, happy wargaming!